Why does the median family of color have less than a dime for every white dollar? 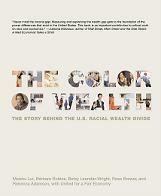 The Color of Wealth exposes how people of color have been barred from government wealth-building programs benefiting white Americans. This uniquely multicultural economic history covers the asset-building stories of Native Americans, Latinos, African Americans, Asian Americans, and European Americans.